The HE403C-GR Elite is Holosun's new green reticle, solar version of the extremely popular HS403C red-dot. It features a crisp green 2MOA dot. Their highly efficient light emitting diodes and solar cells allow Holosun solar optics to run without a battery in many lighting conditions. Additionally, the CR2032 battery lasts up to 5-years. 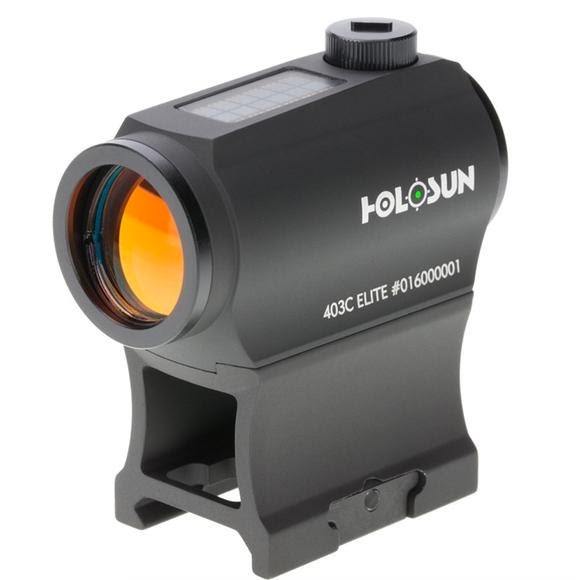 The HE403C-GR Elite is Holosun&apos;s new green reticle, solar version of the extremely popular HS403C red-dot. It features a crisp green 2MOA dot. Their highly efficient light emitting diodes and solar cells allow Holosun solar optics to run without a battery in many lighting conditions. Additionally, the CR2032 battery lasts up to 5-years. The HE403C-GR Elite is compatible with industry standard mounting solutions. Holosun was the first to innovate the ability to run an electronic optic solely on the power of light! Their units equipped with this feature give you the confidence that in the instance that you find your battery has failed, you still can have a fully functional optic provided you have sufficient ambient light. It does not matter whether the light is natural or artificial in origin. Furthermore, the solar array also acts like a light sensor allowing the unit to automatically adjust the brightness to compensate for its surroundings. M.R.S. gives the user the flexibility to use their optic as they need it. Units with this feature allow the user to turn on or off certain sections of the reticle giving the ability to have the ideal reticle for the job at hand. If you need a precise shot, you can run the 2MOA dot only. You need a reticle for fast target acquisition, just turn on an additional 65MOA ring with the push of a button! The best part: no need to rezero your optic when switching between reticle options! Holosun has been a leader in laser and LED technology for many years. The new Super Green LED is their latest advancement in this field. They have created a new green diode allowing it to be as much as 4 times efficient than their standard red diode. Not only does the Super Green LED give the user an option for those who have difficulty seeing in the red color spectrum, but it also gives greater power efficiency when using the optic in high brightness settings.